Mum on baby's near fatal illness: "It just looked like teething symptoms"
South Australian mother Tiffany Henderson told Nine News that getting her daughter treatment in the nick of time almost definitely saved her from dire consequences. Tiffany said her seven-month-old daughter, Violet, was a little bit unwell, but the symptoms resembled teething woes, and initially didn’t seem too serious. But things took a turn for the worse and this quick-thinking mum realised something more serious was afoot. The very concerned mum rushed Violet to the doctor, and she was promptly put in an ambulance and transferred to a local hospital at Roxby Downs. As they began treating Violet, the tell-tale rash of meningococcal B began to appear. “[The doctor] took a photo, walked out, came back and said ‘we’re going for a plane ride’,” Tiffany recalls. Violet was flown to a bigger hospital in Adelaide where she spent five days in intensive care being treated. Thankfully Violet is now bright as a button and most definitely on the mend. But had Tiffany not acted as quickly as she did, the outcome could have been very, very different. 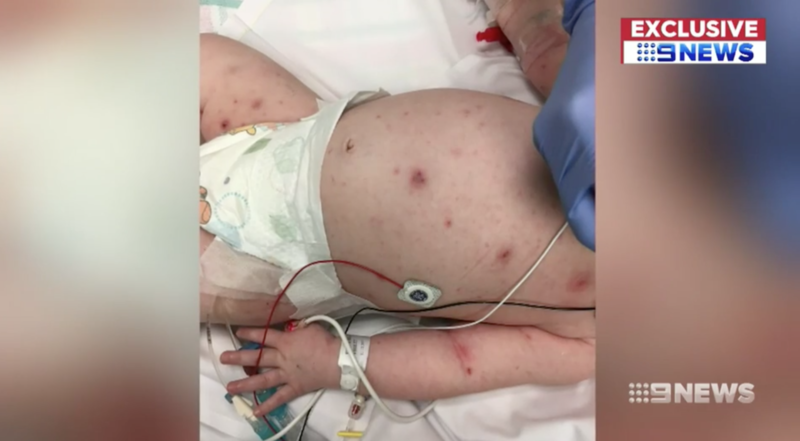 South Australia has the worst meningococcal B rates in the country, the ABC reports, and they’re the first state to include the vaccination as part of the free immunisation program. Tasmania is also set to roll out a free meningococcal B vaccination program, following recent deaths from the disease in their state. WA is also pushing for a similar scheme. The current National Immunisation Program includes an injection for meningococcal ACWY at 12 months. This vaccine doesn’t protect babies and children against meningococcal B, however. Violet’s parents believe all Australian children should be able to access this life-saving vaccination via the National Immunisation Program, to save other families enduring the horror they’ve just been through.